Richard Fairgray was born and raised in New Zealand and has been publishing since he was seven years old. He has been working exclusively in comics for the last seven years with longtime collaborator Terry Jones. Their main work together is the ongoing series Blastosaurus. He lives in Auckland, New Zealand. 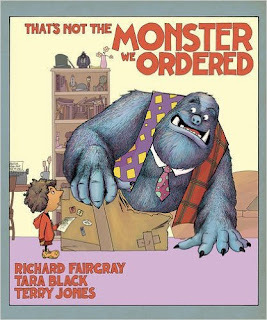 That's Not the Monster We Ordered by Tara Black is an amazingly fun book for kids! It's an extremely fun twist on household pets that is sure to make kids smile. That's Not the Monster We Ordered by Tara Black has quickly become one of my kids favorite books. When they saw the monster on the cover they weren't too sure what to expect but as soon as I began to read the book to them, they were in love! My kids love the silly antics throughout this book and I can't even tell you how many times they bring this book to me to read throughout the day. They even bribe their older sister to read it too them when I can't read it to them. The illustrations are also extremely fun and entertaining. I highly recommend this book as I'm sure it will be a favorite in your home just like it is mine! You can find That's Not the Monster We Ordered by Tara Black on Amazon, Barnes and Noble, Goodreads and other bookstores.